The installation of aircraft seat actuation systems has considerably increased in the past few years in response to the surge in air travel. According to Transparency Market Research (TMR), consumers are more willing to pay for premium air travels for better comfort during long hours of air travel. This is a primary factor aiding the expansion of the global aircraft seat actuation systems market. While the market is currently led by the business class segment, the economy plus segment is expected to soon emerge as the most lucrative one. However, the high cost of aircrafts and their maintenance restricts the bulk purchase of aircrafts, which in turn is inhibiting the growth of the aircraft seat actuation systems market. The emerging concept of low frill airlines is also threating the market’s growth prospects to an extent. Nevertheless, the recent technological advancements will provide ample opportunities for aircraft seat actuation systems manufacturers to capitalize on in the near future. According to TMR, the global aircraft seat actuation systems market stood at US$150 mn in 2014. Rising at a C AGR of 13.1%, the market is expected to reach US$382.22 mn by the end of 2021. By type, the global aircraft seat actuation systems market was led by the business class segment in 2014 with a share of 32%. The segment is witnessing substantial growth due to the increasing demand for better comfort during air travels. Furthermore, rapid globalization has resulted in robust increase of international business trips. This in turn has fuelled demand for aircraft seat actuation systems from the business class segment. It is expected to continue dominating the market through the course of the forecast period. However, TMR expects the economy class segment to exhibit robust growth between 2015 and 2021. The economy class encompasses a major portion of the seating arrangement in an aircraft since most passengers opt for this category. Actuation solutions deployed in this category are limited to linear motions to help passengers adjust their seats. This economy class seating therefore lacks the ergonomics and comfort offered by business class seating. However, the latest technological advancements are expected to make quite a few changes in the economy class seating designs, thus creating lucrative opportunities for the aircraft seat actuation systems manufacturers. 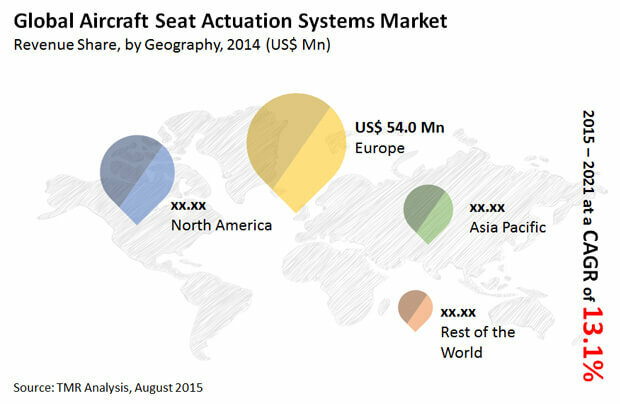 From the geographical standpoint, Europe dominated the global aircraft seat actuation systems market in 2014. The region is witnessing a rising demand for comfortable aircraft seating. This, combined with the presence of several prominent manufacturers, has sealed Europe’s position as the most lucrative market for aircraft seat automation systems in the world. The region is also home Airbus, which is one of the leading airline manufacturers in the world. These factors are expected to support the Europe market to reach US$131.1 mn by the end of 2021. However, TMR expects Asia Pacific to exhibit the strong growth in terms of demand for aircraft seat actuation systems. India, Japan, and China have emerged as the most lucrative markets for aircraft seat actuation systems in Asia Pacific. These countries are expected to witness significant technological advancements over the next few years to cater to the low-cost production needs of the region. This will considerably influence the aircraft seat actuation systems sales in Asia Pacific. Furthermore, rising disposable income levels across emerging economies have made passengers more willing to pay for comfortable flight. This will positively influence the market’s trajectory in Asia Pacific. Some of the leading companies looking to benefit from the aforementioned trends are PGA Electronics S.A., Crane Aerospace & Electronics, Inc, Buhler Motor GmbH, ITT Corporation, Zodiac Aerospace S.A., and Nook Industries, Inc.